Romantic love is a fickle friend. You wanna know what love's about? Give it when you feel nothing. Some things in life are built by coincidence, some by hard work, others by a sheer set of circumstances – not exactly random, but not contrived, either – that lead us to a place of pure synchronicity. To art, maybe. Nashville’s LEAGUES (comprising singer Thad Cockrell, guitarist Tyler Burkum and drummer Jeremy Lutito) might not credit one over the other in terms of which could best explain how they, deep into their careers and different paths, were able to drop it all at this very moment to make music they’d never quite played before but never sounded so right. “It had to happen now,” Jeremy says with a seriousness that quickly fades to laughter. “Not a second earlier.” Because if explaining how they got here is a long story, explaining what they make certainly isn’t: simply, songs rooted in joy. Seriousness, that quickly fades to laughter. LEAGUES is infectious. The ten tracks that make up their forthcoming January debut, You Belong Here, encourage both dancing and introspection, and show a group of men leaving behind any preconceived notions or expectations but never their innate musicianship or love for the craft of songwriting. “I’m not inspired by artists,” says Thad. “As much as I’m inspired by songs.” Tears for Fears’ “Everybody Wants to Rule the World.” “Wanna be Startin’ Somethin’” by Michael Jackson. “Songs that stop the room for a quick second,” adds Jeremy. One listen to the swirling, rock-pop anthem “Mind Games,” the electric thump of “Magic” or the locomotive doo-wop of “Spotlight” and it’s clear that LEAGUES’ music does the same. Just try and keep your toes from tapping. But it wasn’t a straight and simple road. Before the chain of events that united LEAGUES, the members all had careers in their own right – Thad as a critically-lauded singer-songwriter, Tyler as an acclaimed guitarist and songwriter and Jeremy as a self-described “hired gun” drummer. Those pasts certainly aren’t washed away, but any one of them will tell you that they now exist as a band, a cohesive unit. “I don’t want this to be a side project,” Thad says. “LEAGUES is what I am, we are, now.” And at the core is the idea of making music that is built expressly for enjoying with – not just in front of - the audience. “We have a saying,” Thad continues. “Not for me, not for you, but for us.” LEAGUES is a group effort: among Thad, Jeremy and Tyler and those listening and humming along. Sure, the way that the members of LEAGUES came together could be recounted in a chain of events that shows a recurring pattern of eerie coincidences: while on the road backing Mat Kearney, Tyler and Jeremy discussed how they’d like to start something creative together one day, not exactly knowing with whom and when. And when Thad was speaking to his friend, LEAGUES founding member Mike Simmons, about ideas for musicians to work with on a new sound he was toying with, Mike suggested he consider Tyler. A veritable Venn diagram of overlapping musicians. One afternoon Thad and Jeremy ran into each other at an East Nashville restaurant, where they exchanged numbers. “I knew he was a quirky guy,” Jeremy recounts of the moment when Thad switched from pleasantries to a deadpan seriousness when asking if they could talk on the phone later. “I went home thinking maybe he wants me to play on his next record. But he called that night and said, ‘I met this guy, you don’t know him, but we were talking about starting a band, and are you interested?’ That guy was Tyler Burkum…and I just started to laugh.” Not to mention that part of the story had been conceived long ago when Thad saw Jeremy playing drums at a local show in 2005. “I remember thinking, if I am ever in a band, that’s my guy.” Back then, Thad was firmly on his way in his solo career, immersed in the Nashville songwriting scene and crafting acoustic-based, slow-burning roots music. And he continued that way until a few years ago, when suddenly “songs started to come that weren’t singer-songwriter appropriate. I tried to play them alone, but it was like a big gorilla playing a toy drumset.” So Thad, Tyler, Jeremy and Mike came together every six weeks or so, to play music and experiment. “It didn’t sound like four guys jamming,” Thad says. “It sounded like something trying to emerge.” Jeremy agrees. “We are still trying to chase what happened that first time we got together, which is something that makes all of us start laughing. A deep joy, really.” Of course no amount of joy or musical synchronicity can trump reality, and the band members were vastly aware of the daily struggles of balancing home life with their aspirations – or just the dollars and cents of making things work. “We aren’t 22 anymore,” Jeremy says. They had families, children, responsibilities. But they wanted to chase this sound, no matter what. That meant booking studio time, often without the funds to pay for it, and being lifted up by friends and supporters who believed in their music. The sessions culminated in an EP of three crescendoing rock-pop songs so irresistibly listenable that the band had no choice but to keep going. And to say that they dove into this concept head-first would be an understatement. 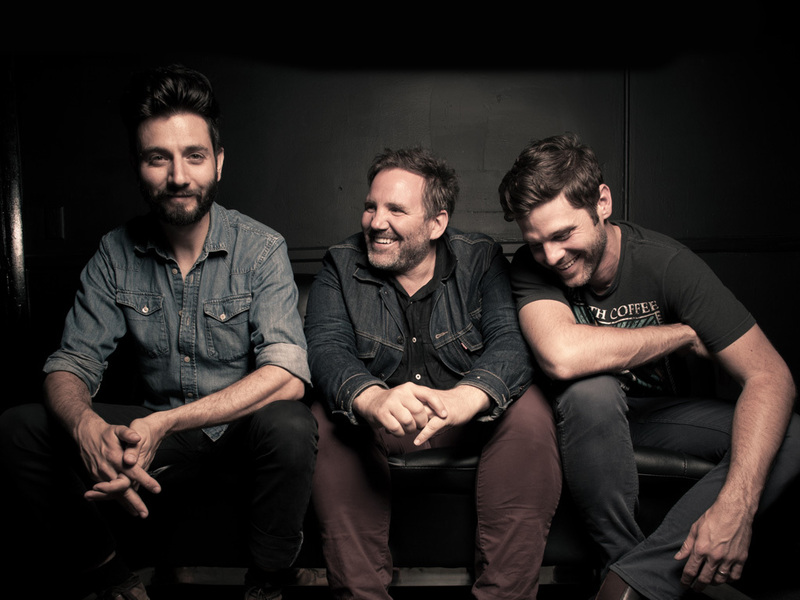 Thad had scheduled a gig opening for Zach Williams & the Reformation in September of 2010 at New York’s Bowery Ballroom, and brought Jeremy, Tyler and Mike along to play with him as a backing band. Halfway through the set, he made an announcement to the crowd that from here on out – including the rest of that very show – he would be performing with and only as LEAGUES. Thad Cockrell, the solo artist, was all but gone. It’s quite a gamble to take, in the middle of a performance, on one of the most recognized stages in Manhattan. The band hadn’t been together very long, and this would be their first show. “But the entire mood changed,” Jeremy says. The crowd danced to songs they’d never heard before, from a group they didn’t know existed. Afterwards, the men erupted into what would become a pattern of post-show behavior: sheer laughter. LEAGUES certainly were laughing when they stepped on to the Ryman Auditorium stage for only their tenth show together– the Fray had seen them play recently in Nashville, and asked the band to be their opening act at the legendary venue. Several dates doing the same for Mat Kearny lead LEAGUES to “become a band in front of a thousand people,” but also put pressure on Mike Simons, who chose to ultimately quit and focus on his family. He’ll always be an essential part of the LEAGUES story, but as Thad puts is, “the fourth member of the band is the pleasure of the audience,” now. That idea is crucial to understanding LEAGUES. This isn’t music played in a vacuum, solely for the benefit of the artist and their insular creative vision. Every moment, note and lyric is made to be enjoyed with each person who comes to a show or hears a song. Instead of letting the hardships of long careers in the music industry wear on them or breed cynicism, LEAGUES have started fresh, un-jaded. They recorded and co-produced with Paul Moak (The Weeks, Matthew Mayfield) their debut over twelve days in Nashville, with the aid of Vance Powell (mixing/engineering) and Chris Athens (mastering), who have worked collectively with everyone from Jack White to Rihanna to Coldplay. “In order to truly create something new you have to do something you don’t know how to do,” says Thad. What LEAGUES creates is ethereal, joyful music that explodes the senses and challenges the mind. Thad may be right – we all have to take risks – but it’s hard to believe that making a sound this true wasn’t something he, Jeremy and Tyler were simply born with the ability to do. Though, maybe, it’s just about the laughter.